Those terrific Tapit 2-year-olds! America's three-time leading sire is setting up a deep bench of impressive young prospects who appear to have great potential to excel over the coming months and further enrich their sire's legacy as the leading active sire of classic quality here in the States. Over the long Thanksgiving weekend, Winter Sunset won a maiden at Fair Grounds on Thanksgiving Day; Wicked Indeed won a maiden at the same racetrack the following day; and on Saturday, Dec. 1, Kingly at Del Mar and Kentucky Wildcat at Aqueduct won their maidens on opposite coasts. 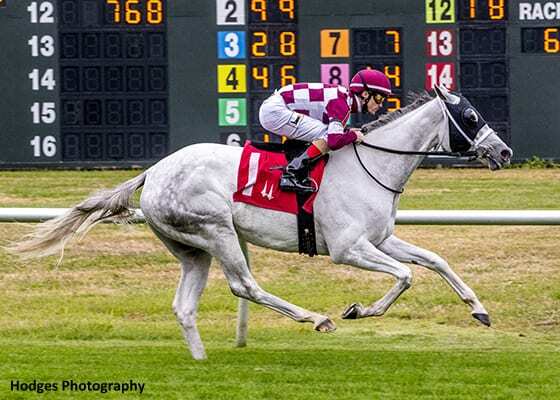 And one of the most-discussed maiden winners of the late fall came on Nov. 17 at Del Mar, when Tapit's son Coliseum won his debut by 6 ¾ lengths and was reported as being listed at 20-1 by an offshore bookmaker for the 2019 Kentucky Derby before that race. Out of Grade 1 winner Game Face (by Menifee), Coliseum is owned and bred by Godolphin, and the handsome gray son of Tapit was heavily favored at 1-2 in his debut on the West Coast for trainer Bob Baffert. Even among the dozens of notably pedigreed, highly valued, and handsomely conformed young steeds in the Baffert barn, Coliseum has already risen to a point of prominence as potentially “one of the ones” who go on to contest the most important races of the coming year. A colt with plenty of natural speed who twice breezed handily from the gate in less than a minute prior to his debut, Coliseum appears most likely to reach his optimum form in races at a mile and farther. Another factor in the colt's favor is that Godolphin has placed him with the most successful classic trainer in America today. Thankfully for the colt's mental composure, Coliseum is unaware of the great hopes and expectations for his future success. The intense pressure for classic competition – and success – is less a concern for Winter Sunset, owned by Coffeepot Stables and Phillips Racing Partnership. First of all, she's a filly and won her debut on turf. More specifically, co-owner Robert Cummings said that the ownership of the Winter Sunset “is not setting out a big plan yet. We're leaving the management to trainer Wayne Catalano, who's done such a wonderful job bringing this filly along and winning her debut really well. “Our focus is on the long-term. Having a sound and happy racehorse who can compete at the best of its ability is a great reward in this game, and we have been lucky enough to have enjoyed some wonderful horses and successes” with the Coffeepot Stables that Cummings owns and operates with wife Annette Bacola. Just last year, “at the 2017 September sale, we bought a Candy Ride filly [later named Liora] that won the Golden Rod Stakes at Churchill” last month, and other important horses raced by Coffeepot Stables include Farrell (Malibu Moon), winner of the G2 Golden Rod, Rachel Alexandra, Fair Grounds Oaks, and Chilukki Stakes, with earnings of more than $1 million; and Imposing Grace (Empire Maker), winner of the G3 Arlington Matron. Bacola and Cummings have been involved with racing horses since the mid-1990s, and some of their greatest thrills have come in connection with the Unbridled's Song mare Rebridled Dreams, the dam of G1 winners Carpe Diem (Giant's Causeway) and J.B.'s Thunder (Thunder Gulch), as well as multiple G2 winner Farrell, which Coffeepot Stables races. Through the Beau Lane Bloodstock consignment, Coffee Pot Stables sold Carpe Diem to Northwest Stud for $550,000 at the 2013 Keeneland September yearling sale. Subsequently pinhooked for $1.6 million at the 2014 Ocala Breeders' Sales Company's March auction of 2-year-olds in training, Carpe Diem won the G1 Breeders' Futurity and Blue Grass Stakes at Keeneland and is one of the promising young sires standing at WinStar Farm. His first foals are 2-year-olds of 2019. Cummings continued: “We sold Carpe Diem's full sister [now named I'm Wonderful] at the 2017 September sale” for $700,000, the second-highest price for a Giant's Causeway yearling last year. As part of Beau Lane's consignment, Coffeepot's filly was stabled in Barn 6 at Keeneland, which faces Barn 1, where Darby Dan's consignment was stabled for owner John Phillips. Winter Sunset is the second foal out of the 10-year-old Winter Memories (El Prado), winner of the G1 Diana and Garden City Stakes. Winter Memories was the best racer produced by Memories of Silver (Silver Hawk), winner of the G1 Queen Elizabeth Challenge Cup and Beverly D Stakes. Third dam All My Memories (Little Current) was out of Java Moon (Graustark), one of three stakes winners and four stakes-placed runners produced by Golden Trail (Hasty Road), whom John Galbreath had acquired for Darby Dan Farm in the early 1960s from the dispersal of Brookmeade Stable. With each of her first five dams being producers of distinction for Darby Dan, Winter Sunset may now be ready to create some winter memories for the owners gathered round the coffeepot of friendship and community. This entry was posted in Bloodlines, Bloodstock, NL List and tagged Annette Bacola, Beau Lane Bloodstock, Bloodlines, coffeepot stables, darby dan, Frank Mitchell, Golden Trail, john phillips, memories of silver, Phillips Racing Partnership, Robert Cummings, tapit, Wayne Catalano, Winter Memories, winter sunset by Frank Mitchell. Bookmark the permalink.